Teaching your toddler about being healthy , active and taking care of their bodies is so important and helps them to develop the habit of self-care. Fitness, good eating habits and being able to understand what their bodies can do, will ensure that your baby becomes a healthy adult because they will see outdoor activities and sports as part of their lives. Children are naturally active and want to use their bodies to crawl, walk, run, jump and climb. The more chances and opportunities you give them, the happier and more confident they will be. Using up energy also usually makes them sleep better and behave more pleasantly. When choosing physical activities for babies, toddlers and young children, focus on activities that are fun. Activities that children enjoy increase their ability to move with confidence and competence. 0-12 months olds need plenty of opportunities for unrestricted movement. By choosing or creating a safe environment that encourages exploring and the development of skills such as reaching, rolling, sitting up, crawling, pulling up, cruising and walking, you can provide those opportunities for your little one to be active. Even tiny babies like to stretch and play. Place a large blanket on the floor (or on the grass, if you’re outside) to create a safe, clean and welcoming place for babies to practise lifting their heads or develop strong muscles during ‘tummy time’. It’s also the perfect place to learn to roll, creep, crawl and sit. If you put a toy just out of reach, you’ll encourage your baby make an extra effort that will help physical development. Before putting baby on the floor, take a look for potential hazards down at baby level. Stay with your baby at all times to keep things safe. Playing lots of games is also rewarding. Even only slightly physical games, like pat-a-cake and peek-a-boo, can do a lot to help your baby’s learning and movement skills. And taking your baby to new places will stimulate curiosity. Allow baby to lie and kick her legs. Once your baby is walking, there’ll be no stopping for breath. You can support this new physical mastery by allowing your toddler to be active rather than keeping them confined to strollers. Take the time to walk slowly with your toddler, to look at things and to explore-even if it means leaving 10 minutes earlier! 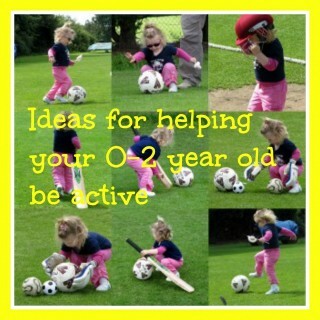 Provide toys and activities that encourage movement. For example, when you help your child climb a slide at the local playground, you’re building self-confidence and balance. You’re also paving the way for your child to climb stairs. Make time for your toddler to walk with you rather than use the buggy. Take them swimming- great exercise and an important lifeskill! The most important thing is to make time for your children to exercise and be active. Try to fit in short bursts of time every hour or so for physical activity-it’ll keep you sane and benefit your baby! I'm the mother of three fantastic, inspiring and exhausting children. I love getting messy with arts and crafts, baking and cooking (with or without kids), scrap-booking and decorating my home with unique handmade objects. I like to try out new ways to get fit, healthy and to shift a few of those niggly pounds. I am also interested in learning ( I have a Higher Diploma in Junior Primary Education and used to teach ages 4-12) and am always on the lookout for great educational ideas and activities to share. You can read more about me on the About Carla page. Visit ToddleBabes's profile on Pinterest. Reviews for children's products & household goods, sponsored posts, beauty products for age 40 plus.